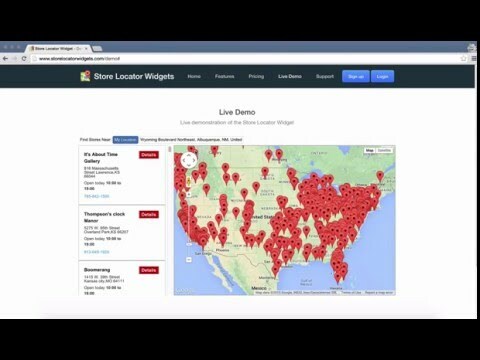 Store Locator Widgets is a fully featured store locator tool which can be configured, customized and embedded into any website for location tracking. Designed for integration with e-commerce websites, but adaptable to any kind of location requirement including dealers, distributors, doctors and more, Store Locator Widgets provides the tools needed to create and embed a locator widget to any website. The Store Locator Widgets app allows users to create location maps by uploading locations manually, in bulk using .CSV or Excel files or by using the REST based API for location management. In order to create a customized and smart locator widget, users can choose from various formats and features such as filter checkboxes, single store mapping, multi-store mapping, images and custom colours, fonts, sizing and markers. The location maps also support geolocation, address autocompletion, search within radius and a built-in distance calculator. Store Locator Widgets can extract and store information on customer activity and search history in order to create real-time analytics and can even generate a heatmap of most searched locations to highlight where there is customer demand for new locations. Analytics can be exported to CSV, PDF or Excel with just the click of a button. From the moment I created my account, I could tell this is exactly what we needed for our brand new dealer locator. Having the "database" of information be a Google spreadsheet that is synced with service makes it so easy to make changes, and add dealers easily. I worked with Tom several times when I needed help getting customizations just right. He is so quick with responding and his help has been crucial in getting our locator launched. I would love a few additional layout options for the map/store listing, but we are perfectly happy with what have now. Frankly, the hardest part of setting up the widget was the Google Maps API. Yes, you can easily get an API key, but if you don't jump through all the other hoops set up by Google, it won't work properly. Provides a needed service for the community we serve.The easy to use interface makes using Store Locator a breeze while integrating beautifully into our Squarespace website. The customer service is amazing and has gone above and beyond to meet our unique needs. The easy to use interface makes using Store Locator a breeze while integrating beautifully into our Squarespace website. The customer service is amazing and has gone above and beyond to meet our unique needs. So far we haven't found any negatives about Store Locator. Will be sure to update if we do find anything to report. Wonderful experience testing out the store locator widget, once the platform we are working on launches......can't wait to activate the account and impress members/clients! Being an average excel user I had no problems there....but beyond that - I'm clueless. The support I got from CSR (store Locator support) was essential and impressive - fast and efficient.....and friendly! Being an average excel user I had no problems there....but beyond that - I'm clueless. The support I got from CSR (store Locator support) was essential and impressive - fast and efficient.....and friendly! Powerful store locator software that was really easy to add to my website. The support guys are Store Locator Pro couldn't have been more helpful in getting my business up and running with their store locator service. I had things up and running within less than an hour including uploading my list of luxury holiday home locations and configuring it so it blended in seamlessly with the rest of my website. Basic plan: $9.00/month and covers up to 100 locations. Premium plan: $29.00/month and covers up to 1000 locations. Ultimate plan: $49.00/month and covers up to 10,000 locations. Enterprise plan: $79.00/month and covers up to 100,000 locations. Free 30 day trial on all plans. Text and features within the store locator widgets can be modified to suit business needs meaning the widget can support any language or business type by changing the titles, filters and buttons. Store Locator Widgets fully supports all major CRMs including Shopify, Facebook, Wordpress, Joomla, Squarespace and Magento. Users can choose whether the store locator automatically geolocates customers on the map upon loading in order to identify the closest store to the customer's current location. Create clickable search filters for the store locator map in order to narrow down the search. Flexible search options can align with the user's store categories or purpose. Store Locator Widgets automatically syncs with Google Docs Sheets so that any store information updates within Google sheets - such as address changes, new additions or changes to opening hours - are instantly updated within the locator store list. Below are some frequently asked questions for Store Locator Widgets. Q. What type of pricing plans does Store Locator Widgets offer? Q. Who are the typical users of Store Locator Widgets? Q. What languages does Store Locator Widgets support? Q. Does Store Locator Widgets support mobile devices? Q. Does Store Locator Widgets offer an API? Yes, Store Locator Widgets has an API available for use. Q. What other apps does Store Locator Widgets integrate with? Q. What level of support does Store Locator Widgets offer?